The future is bright in Philadelphia, where the Phillies are finally on a rebuilding path. But don't expect 2016 to be a season to remember. This week, SI.com is previewing all 30 MLB teams for the 2016 season, counting down to the No. 1 team in the league. At No. 28: the Philadelphia Phillies. After three straight seasons of diminishing returns, Philadelphia bottomed out in 2015, losing 99 games for the team’s worst finish in almost two decades. But heading into 2016, there’s plenty to suggest that the Phillies are heading in the right direction. The team has a new front office that is led by president Andy MacPhail, a longtime executive for multiple teams, and general manager Matt Klentak, an ex-Angels assistant GM, and it has placed a long overdue emphasis on analytics. The roster is young and full of promise, albeit short on players with a history of production at the major league level. Philadelphia also boasts the No. 1 pick in this year’s draft, giving it another blue-chip prospect to add to a farm system that ranks among the game’s best, and another top-five selection likely awaits after this season. The contending teams built (and subsequently neglected by) departed general manager Ruben Amaro Jr. are long gone, but a new, young nucleus is being put in place. Leading the charge is third baseman Maikel Franco, who burst onto the scene last year by posting a 127 OPS+ and 1.7 Wins Above Replacement in 80 games before a fractured left wrist in August put an early end to his season. Franco, 23, bashed 14 homers in just 335 plate appearances last season, and he’ll be the main power threat for a lineup that will have 24-year-old speedster Odubel Herrera up top and 29-year-old slugger Darin Ruf as a potential impact bat. The rotation, meanwhile, is led by 22-year-old Aaron Nola, who posted a 111 ERA+ and a strikeout rate of 7.9 per nine in 77 2/3 innings, and 23-year-old Vince Velasquez, who was acquired from the Astros in the Ken Giles trade and fanned 58 in 55 2/3 frames for Houston last year. As exciting as those players are, the farm system boasts perhaps more promise. Shortstop J.P. Crawford, the team’s top prospect, should be starting in Philadelphia by midseason. Last season’s Cole Hamels trade with the Rangers landed Nick Williams, who could be the Phillies’ centerfielder of the future; righthander Jake Thompson, a potential mid-rotation starter; and catcher Jorge Alfaro, who has arguably the most power of anyone in Philadelphia’s system. There's also 2011 second-round pick Roman Quinn (a .791 OPS as a 22-year-old centerfielder in Double A last season) and ‘15 first-round selection Cornelius Randolph (a .425 on-base percentage as an 18-year-old in rookie ball). For the first time in years, the Phillies and their fans have every reason to be excited about the future. The future may be bright, but the present isn’t very sunny in Philadelphia, as this year’s Phillies simply lack talent. Aside from Franco, Herrera and possibly Ruf, the lineup is bereft of above-average hitters, and the rotation is equally thin behind Nola. Prospects like Crawford, Williams, Thompson, starter Jerad Eickhoff and outfielder Aaron Altherr will eventually bring some upside to the lineup and rotation, but until then, the majority of Philadelphia’s roster is a collection of washed-up veterans and back-end options miscast as everyday starters. While Phillies fans wait for the kids, they’ll have to suffer through the final painful days of first baseman Ryan Howard and catcher Carlos Ruiz and lackluster innings and at-bats from fill-ins like reliever David Hernandez, starter Jeremy Hellickson and shortstop Freddy Galvis. A losing season is a lock and 90-plus losses are a guarantee, with 100 or more not out of the question. To be fair, there should be no expectation of the 2016 Phillies contending or even coming close to it. The lineup is too weak, the rotation lacks depth, and with Giles now closing in Houston, the bullpen is also a question mark. On top of that, Amaro and Klentak have stripped the roster down to the nuts and bolts, leaving little if nothing that could be used to acquire additional prospects. The Phillies’ future will thrive or die on the strength of the young players and prospects already assembled; injuries or poor performance on their part will push back that contention timetable, perhaps for a very long time. Of all the top prospects brought to Philadelphia in the last year, none is more compelling or mystifying than Appel, the No. 1 pick in 2013 who was acquired in the Giles trade. Plagued by inconsistent velocity and results, the 24-year-old righthander stumbled through three seasons in Houston, getting plastered across multiple levels (his minor-league ERA is an unsightly 5.12), and his inclusion in the deal felt more like an afterthought. Given his age and lack of results, the odds are against him being a contributor to the Phillies at any level. So why tab him as Philadelphia’s X-factor? 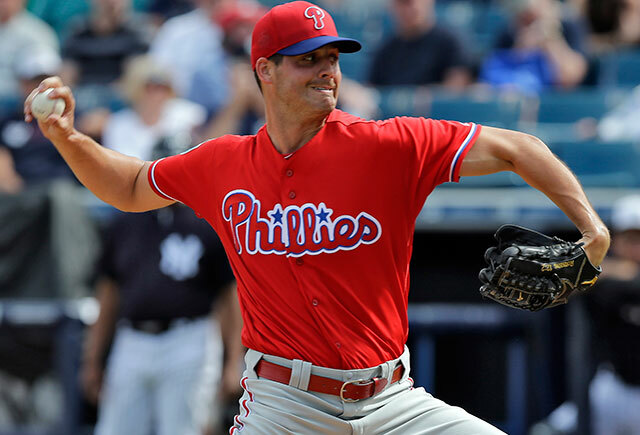 Because if Appel can somehow rediscover the form and stuff that made him the best pitcher in college baseball from his time at Stanford, he could give the Phillies an unexpected boost in a rotation (or bullpen) lacking in impact arms. And at this point, no one is counting on anything from Appel, making him a perfect fit for a team seemingly built out of lottery tickets. If he busts, he’ll be a footnote in Philadelphia’s long climb out of its Amaro-created hole. But if he hits, he’ll be yet another young player ready to make the Phillies contenders once more. You can count the number of Phillies with guaranteed contracts for 2017 on one hand: Howard, Ruiz, lefty starter Matt Harrison and righty starter Charlie Morton. Together, that quartet will earn just under $25 million next year, and it’s likely that all four will be paid not to play in Philadelphia: Howard and Ruiz have team options that will not be picked up, Morton’s $9.5 million mutual option will likely be declined, and Harrison probably won’t be pitching for much longer due to a persistent and chronic back condition. The team’s new core, meanwhile, will be drawing below-market paychecks for quite some time, giving the Phillies almost limitless payroll room in free agency. That won’t have much of an impact in the 2017 off-season market, when there will be few (if any) available franchise players on the right side of 30. But that lack of long-term commitments should come in handy for 2018, when superstars like Bryce Harper, Jose Fernandez and Matt Harvey will be looking to cash in as best they can. If Philadelphia’s group of young talent can play up to potential, that combination of performance and available money could entice some big-market free agents, which would substantially accelerate the Phillies’ rebuild.